Member of the Fabaceae or Leguminosae (pea) family. Native to the Eastern US and Canada. Related species include Acacia, brooms, locust, palo verde. 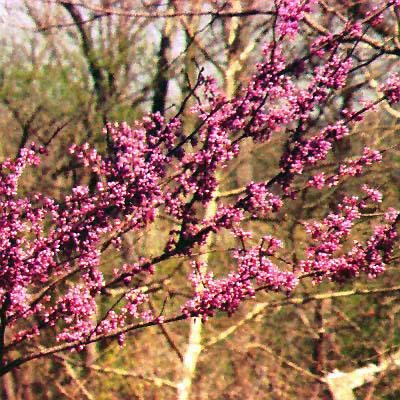 Small flowers with wing and banner petals occur along woody branches. Stems are woody, cut to various lengths. Plant is a deciduous shrub or tree, classed as a dicotyledon, leaves not parallel veined. One of relatively few plant species that can transform nitrogen from the atmosphere into a nitrogen form that plants can use as a fertilizer. The specific epithet name “canadensis” means of Canada. Cercis from Greek “kerkis” (name given by Theophrastus to describe its large, woody, flattened fruit). Redman et al. (2002) reported that 35-45F storage temperature gave equal results (they did not try lower or higher temperatures), at these temperatures they could be stored wet for only a maximum of one week, STS was not beneficial but flower food did enhance flower life.